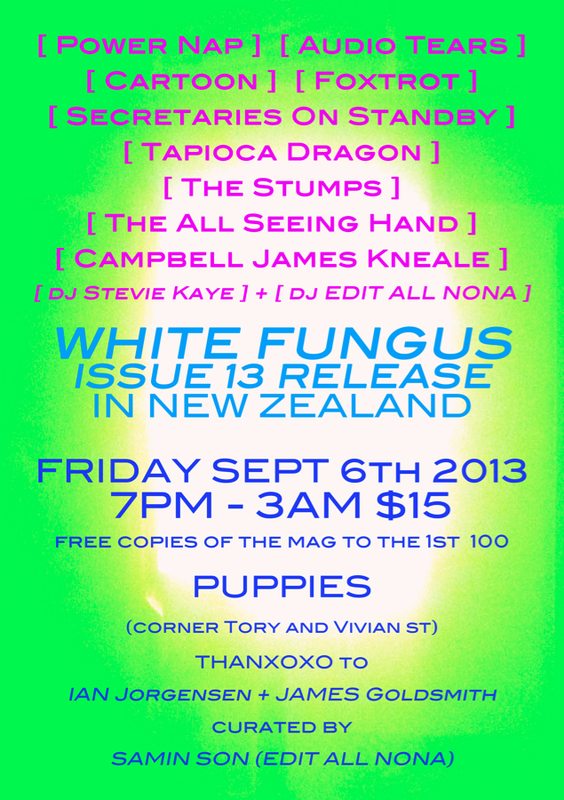 White Fungus is about to celebrate the release of its 13th issue at Puppies in Wellington on Friday September 6. New Zealand/Korean artist Samin Son has curated an explosive line-up to bring out the occasion. The night will feature performances by Power Nap, Audio Tears, Cartoon, Foxtrot, Secretaries on Standby, Tapioca Dragon, The Stumps, The All Seeing Hand and Campbell James Kneale plus DJ sets by Stevie Kaye and Edit All Nona. Entry is $15 and kicks off at 7pm sharp, the first 100 people to attend will receive a free copy of the magazine. The new issue of White Fungus is packed with New Zealand content, including an in-depth article on the subject of bats by Tessa Laird, a 20-page comic by Tim Bollinger, and fashion spreads by Auckland artists Clara Chon and Richard Orjis. Auckland curator and writer Andrew Clifford talks to artist Brydee Rood about life in transit, and Mark Amery writes about the Wellington Media Collective. New Zealand art critic John Hurrell writes about the veteran New York artist Tony Martin, including his work in the 1960s at Howard Wise, a New York gallery connected to the New Zealand artists Len Lye and Billy Apple. White Fungus is an arts magazine and interdisciplinary project based in Taiwan and New Zealand. 2013 has already been an eventful year for the project. The year has already seen a magazine residency in San Francisco, a motorcycle accident for the publication's editor Ron Hanson, inclusion of White Fungus in an exhibition in Russia, the holding of a smash “Noise” event in Taipei, and now a New Zealand distribution deal with Gordon & Gotch for its new 13th issue. Hanson says that for years running the magazine the going was steady and slow, but in 2012 the publication had a breakout year. At the beginning of that year White Fungus was selected for the exhibition Millennium Magazines at the Museum of Modern Art in New York. It would be the first of 17 exhibitions and fairs White Fungus was selected for in 2012, in places including the UK, Hong Kong, Singapore, Cyprus, Italy, the Netherlands, Tokyo, Dublin, Prague, China and Vancouver. White Fungus was exhibited in the New Zealand pavilion at the Frankfurt Book Fair.